Looms can be the size of a house or as simple as a wooden frame. A frame loom has the warp as one continuous thread. 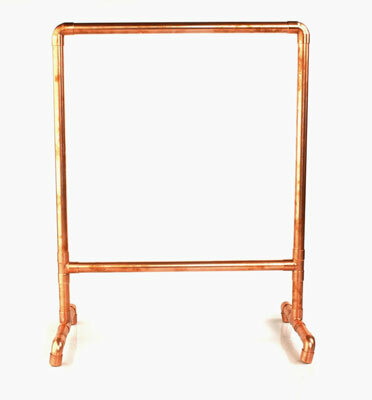 A simple frame loom can be made from any type of pipe. 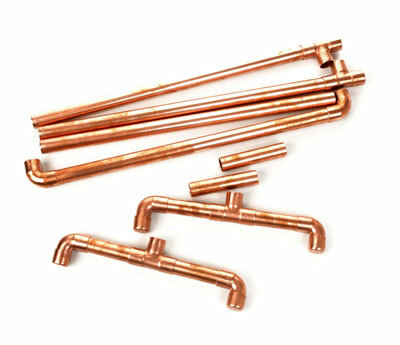 The one shown in the following figure is made from copper pipe, although you can also use PVC pipe. The directions are for an 18-inch weaving surface, although you can vary the size of the loom by using different lengths of pipe for the side, top, and bottom bars. Cut six 4-inch pieces of copper pipe and four 18-inch pieces. Pipe cutters are inexpensive and surprisingly easy to use. However, if you don’t want to cut the pipe yourself, some hardware stores can cut it to length for you. Attach the two 90-degree elbows to either end of one of the 18-inch pipes. Place an 18-inch pipe in each of the open ends of the 90-degree elbows. Attach a T to each open end of the 18-inch pipes. Use the long end of the T’s. Place the remaining 18-inch length of pipe into the short ends of the T to form a square. Place a 4-inch piece of pipe into the open ends of the attached T’s. Attach a T to both of these 4-inch pieces using the short end of the T.
Secure the remaining four pieces of 4-inch pipe into the ends of the T’s. Place the caps on the street elbows and place the street elbows on the open ends of the 4-inch pieces. These will form the feet on the loom. Wrap a small square of plastic wrap over the ends of the pipes to hold the fittings firmly in place. The plastic wrap will hold the pipe together as if it had been glued, but you’ll still be able to take it apart to adjust the size of the loom. Make sure that everything is snug and even.